So happy to be posting today about my HUE Animation Studio and the videos that my kidpeople and I made with it. 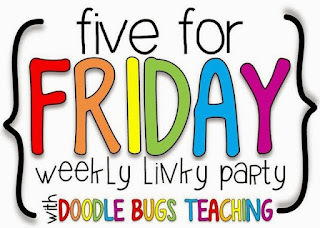 Today I'm going to share about the process with the help of Doodle Bugs Teaching Five for Friday linky. Here are our two animation videos we've done thus far. This is the World Premiere of Winter to Spring. Whoot! And here is our first one, A Day at the Races, which I posted on Tuesday. What'cha think? Fun, eh? I am so very happy that HUE gave me the kit to use. And I am so happy that they are going to give one to one lucky blogger! Yep. Later in this post you'll have a chance to enter to win a HUE Animation Studio. You can find out how this came about if you look at my last post here. 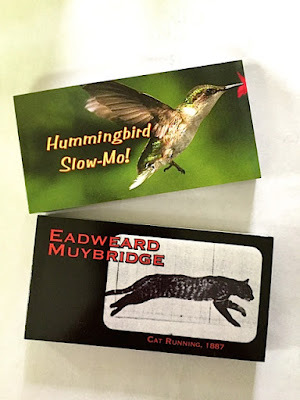 I guess I must start by being completely honest– when I first knew the kit was coming my way and I knew I had to do a project AND post about it for the world to see, I sort of hit the panic button. WHAT if I couldn't make it work? 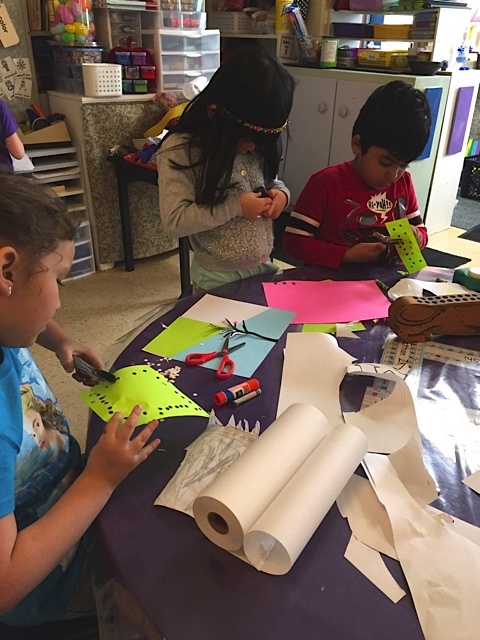 WHAT if I couldn't come up with an idea that my kindergarten students could do? How was I going to involve them all? WHAT had I gotten myself into THIS time?? I will share the process we used to come up with our videos in five steps. The process was messy and somewhat serendipitous and not as neat as it looks here in five steps, I can tell you that. It is only after the fact that I can organize my thoughts so that, hopefully, they will help you as you think about using animation with your kiddos. Here we go. 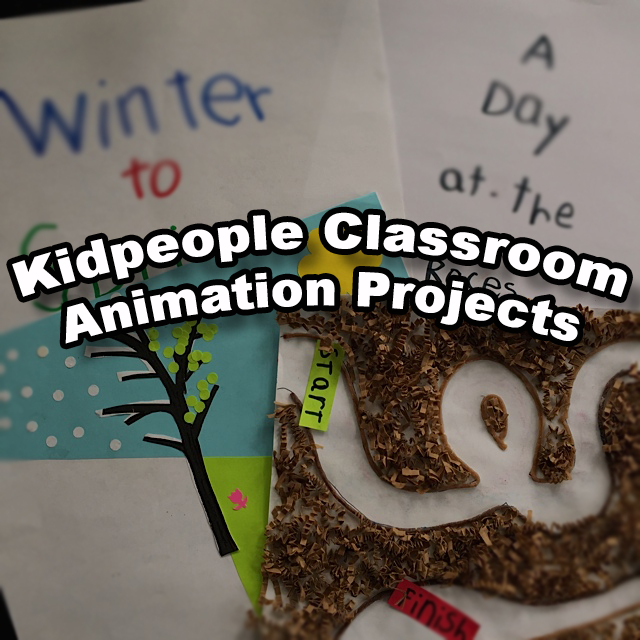 First of all, I set three goals for myself and my students– we were going to learn how to make an animated video, our animation project was going to be an extension of current classroom learning, and we going to have fun! And this one that uses a photo character. You can find lots of videos done with HUE on the HUE YouTube Channel. Click below. Then I brainstormed (with DH Jonathan, my partner in crime on so many projects) about how claymation or photographed characters could lend learning to our current topics under discussion in class. I thought perhaps the topic of spring and worms could somehow become videos. And because we were in the poetry unit, perhaps we could incorporate poetry. 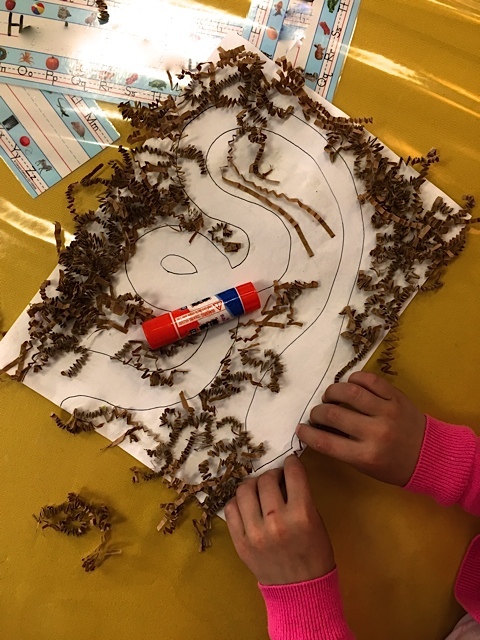 It would be pretty easy for my kinders to make clay worms, I thought. And a group poem would be fun, too. A poem about worms? About spring? hmm... Well, with those ideas in mind I thought I'd get feedback from the kidpeople. When it came time to share with my students I showed them the two videos that I had found. They loved them, of course. I also showed them a couple little flip books that I had. These really allowed them to see stop motion animation in a concrete way, because you could see each photo on each page, then see them go by quickly as you flipped, making them look like a movie. You can visit their site by clicking below. Be sure to look at the flipbooks ahead of time before showing them to your kids, though. Many are child appropriate, but not all. I explained how the camera would take one picture, then we'd move our characters a bit and take another picture. And repeat, just like the photos on each page of the book did. Then I told them we needed to come out with a plan or a story that we wanted to tell. I asked them if they thought they could make clay worms– they all said yes– and I said the worms would need to do something. Their suggestions were– come out of their holes, eat something, race? Racing won, hands down. We had to discuss how they would race and where. Underground wouldn't quite do it, but a "race track" would. When I got home, there staring at me on the table where they had been sitting for months, were these little cut out figures of my students. I took the photos back in January and cut them out for a snowglobe project that never came to be. I played with one of them and thought about how the pose helped them cartwheel without too much effort. Too bad the kids had been wearing snow gear for the photos as they were rather outdated for a project now in April with spring just around the corner... or at least that's what the kids and I had taken to saying often in the last weeks. Spring was long in the coming this year... Ah, ha. How about if these kids in snowsuits transformed into kids in spring clothes? 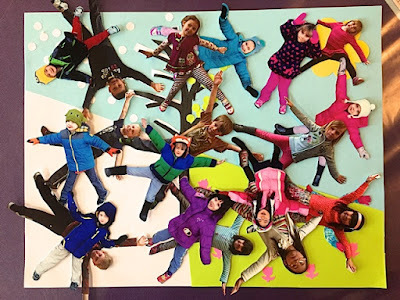 I took the snow geared figures to school the next day and we talked about how we could use animation to let the characters go from dressed for snow to dressed for spring. Out came the iPhone to take pics of the kids posing in cartwheel poses. I spent the evening cutting out the spring versions of my cartwheeling kids... I'm afraid this required too fine a cutting task to be undertaken by kindergartners. Back at school the next day, I set up the camera for the first time. The HUE camera connects to your laptop and the software allows you to see what the camera is currently looking at, and what photo you last took. It is incredibly easy to use. I hooked up my laptop to our classroom projector so all the kiddos could see the process. I took a series of photos, making one of the students cartwheel in her snowsuit across the tabletop, switching out the snowsuited figure halfway though into the same student in spring clothes. It was very crude with choppy movement but the kids loved it. We brainstormed what the set should look like and decided it made sense for the kids to roll down a hill, and maybe they could "change their clothes" behind a tree. Now that we had two productions underway I was more confident everyone could do a job. I made a list and let kids sign up: worm making, set production of the racetrack, or set production of the hill. 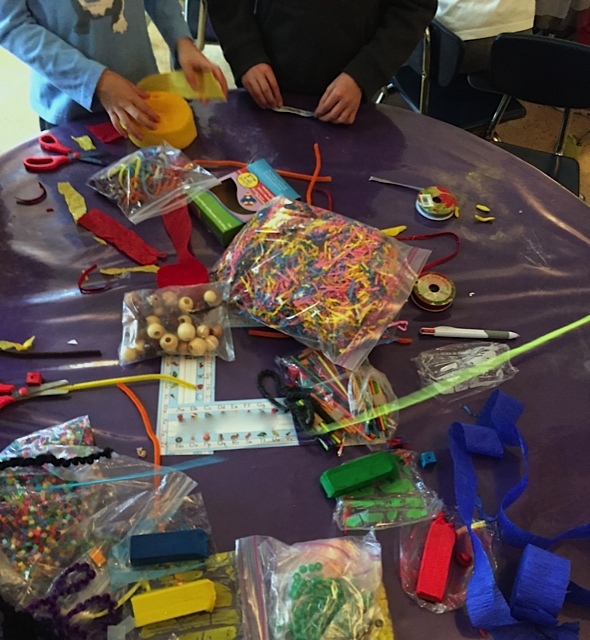 Everyone got to work and we spent the better part of an afternoon picking and choosing from the wide variety of materials I pulled out of the art supply closet. The worm making table was coming out with all sorts of worm creations. 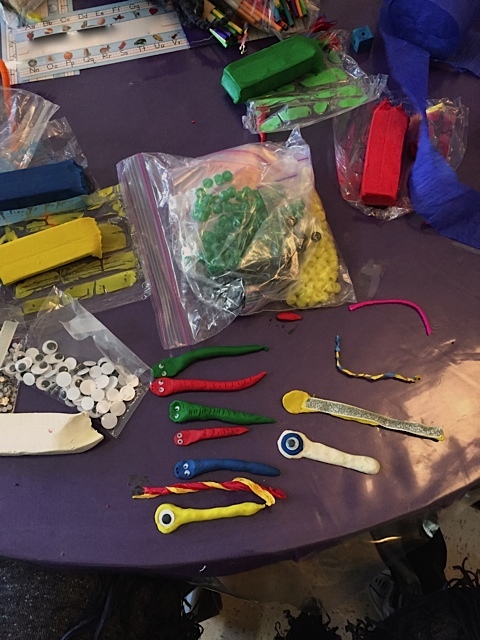 They tried making worms from clay, playdough, ribbons, yarn– all of them with googly eyes, of course. I didn't know which worms would end up in the final production but they were having lots of creative fun making them. There was even a bit of scientific talk. Student 1: "Real worms don't have eyes, but they do have light sensors." Student 2: "These ARE light sensors." The worm racetrack group was especially taken with the shredded brown paper as that looked like dirt that worms would race in. I helped them decide on a route. To help the track stay nice and clear, I told them to outline the track with Wikki Stix. They used lots of glue to cover the rest of the paper with the shredded paper. The hill set builders were very busy but lots of scribbled coloring was making their pictures look pretty busy. I was afraid the little cartwheeling figures would get lost in the background. 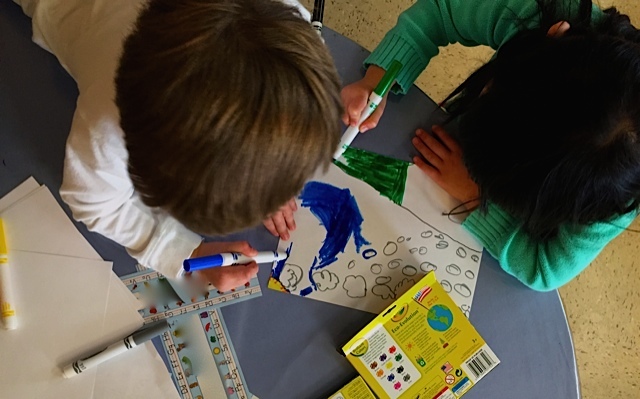 I suggested that instead of the whole paper being filled with coloring, they would use blue paper for the sky, white for the snow, and green for the grass. 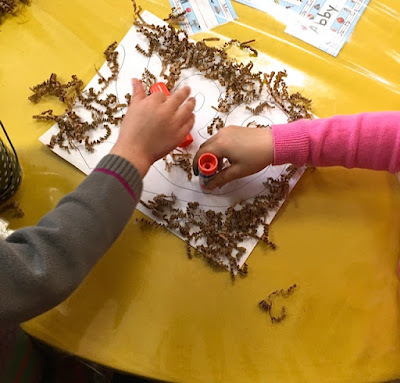 I help them trace the paper so it looked like the hill they had created and they cut out and puzzled together the three colors to make a new hill. We found a very simple tree on the internet and one little guy patiently cut that out, leaving some white for snow on the branches. Several others got to work with paper punches to make the snow, leaves, flowers, and even the sun. We had a discussion during all of this about what the movies could be called. As they kept coming up with racing themed ideas, I told them that there was an old music CD that I used to listen to (okay, so my Queen album was vinyl, but that would have been too much of a history lesson) and an old famous movie called A Day at the Races. That won by a smidge over A Day at the Worm Races. Winter to Spring made sense to everyone without much discussion. Back in November we wrote a class poem called NOvember. I blogged about it here. How about if we all contributed one line that illustrated something that changed from winter to spring like we had done in the NOvember poem with summer to winter? I thought this was an idea we could run with, and sure enough, every student contributed the next day when it was time to create our poem. We had boots to sneakers, cocoa to lemonade, bare to bud. I wrote down our poem as we came up with it, then cut the lines apart and handed them out to each student. We gathered in a circle and practiced saying our lines. Then I turned on Garage Band on my laptop and although it took several takes, we had our soundtrack for Winter to Spring! Yippee! I figured I could come up with sound effects for the racetrack movie. I had a couple of the kids record a few racing sounds just to have available. The next day I had the camera set up and all the props ready to go when the students came back from lunch. I chose two worms made of clay because I thought they would be easier to move than some of the others, and they fit on the track best. I had to gently nix the notion that every worm was going to be able to race by explaining that not every actor who goes to Hollywood gets into a movie. Luckily everyone was pretty distracted with a chance to move the worms around and click the camera. We did really big movements so everyone could see the "story" that came out pretty quickly– Green Worm cheated by cutting out the loop and then Red Worm climbed over stuck Green Worm to win by a hair... with lots of debate on who should win. I played it back periodically and it was really choppy, with plenty of hands in the frames because the person with the camera was button happy, but they all got the idea. Then we worked on getting the figures to cartwheel down the hill. That was a bit trickier. We ended up finding a pivotal point on each little character where somebody could place their finger to hold it while another student moved it a little. The HUE software shows an "onion skin" image of the previous photo as you go to take the next, so you can see exactly how much you are moving the figure frame by frame and that was VERY helpful. And because this took more time, even doing it pretty fast with big movements, I let everybody have free choice and then called over just a couple kids at a time to get a chance at filming. I also had a couple of my kids with neat handwriting make the title credits, knowing we would need those in the final production, too. Okay, so at this point every student had been given the opportunity to participate in several levels of movie making. From character and set production, to poem writing, to audio recording, to actual filming. I was left with raw footage of two movies with lots of photos of little hands included, and a recorded poem. Our audio recording of the poem was 41 seconds long and we only had about fifteen seconds of tumbling kids! Yikes. Granted, we hadn't used all the figures. (I didn't have figures of every student as I only used kids who were there on the days both photos were taken.) I knew that I would need to lengthen the movie as there wasn't a whole lot I could do with the recording. I played around with the settings of the shots- this is easy to do with the software. And I filmed the movie again, using smaller increments of movement as the kids came down the hill which equaled many more shots. This movie was still too short by a bit, so then it was a matter of showing the title credits by a few more seconds, which meant taking more shots of those sheets. I got it to fit! Look out George Lucas!! I broke A Day at the Races into more shots, too. That movie could really be any length though, as my choice of sound effects was greater. Although I had the recordings of the kids making race car sounds, in the end I ended up purchasing racing sound effect tracks from iTunes. Being familiar with iMovie (which I am as I do an end of year movie for each class) was a big help in adjusting the fit of the sounds to the filming. You can slide the tracks around so that more or less of each sound is heard. Getting the race car sounds to fit the brief seventeen seconds of film was not too difficult. WHEW! Congratulations for staying with me this far! It certainly was a process, but we all really love our movies and have watched them each a million times. I included both movies on the DVD of our end of year class movie and I know they will be watched a million times more at home, too– lucky parents. snort. The kids are very proud of their work. Hopefully this post helps your own creative juices flow. HUE is going to post about our project on their blog, so I'm happy more teachers will see it. There really are SO MANY different things you can do with the Animation Studio. It could be applied to lots of classroom projects by kids of many ages, as my kindergarten students demonstrate with our projects. Next week my post will include a downloadable sheet of tips on making an animation. I hope it will be useful to anyone who wants to do an animation project with their students. Now here's your chance to win the HUE camera and animation kit for yourself. I am giving it away with Stephanie over at Forever in Fifth Grade. If you follow me on Bloglovin' or email, and you follow her on TPT you can get TWO chances to win. I'm sorry to say that because of HUE's shipping restrictions only those living in the United States can enter the giveaway. And a note to my readers who are already following– you can enter, too, of course. Just tell me how you are following and I can look you up. Click on Stephanie's button below to follow her and get a second entry. Thanks to Kacey at Doodle Bugs for the linky. You can scoot on back to hear from more bloggers! I love this...and the comment about not all actors who go to Hollywood make it into a movie, LOL! I definitely entered the giveaway! You are amazing! WOW! These came out so great. Thank you for sharing them!!! What a super idea. Glad I follow you! Thank you for sharing your experience using the HUE animation kits. I was just awarded my grant for HUE animation kits last month and I am in the process of getting my software installed. I cannot wait to start the new year off using them with my students in the media center. 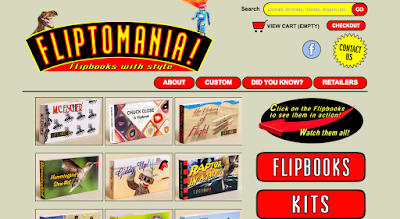 Your post was very helpful in getting me started to move forward creating animated stories. Thank you again for sharing.